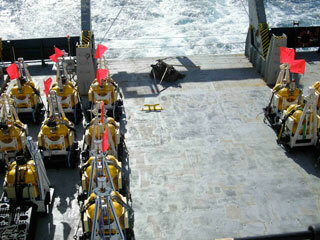 Our deck is filling up with recovered OBS's waiting to be sent home. 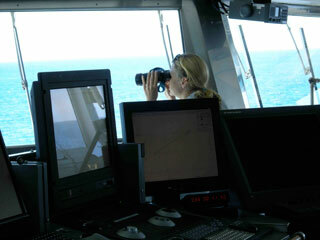 We have completed our work off the west coast of New Zealand, and are now heading south and east. 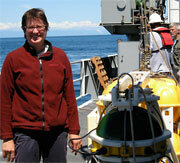 The count is 20 out of 21 ocean bottom seismometers (OBS) recovered. That is a good recovery rate. Out of the 21: one was not found – no signal (NZ17), one was picked up by fishermen in July (NZ15), two had to be dredged up from the bottom (NZ9 and NZ10), and the remaining 17 came up without incident. We have 9 more OBS’s on the east side to pick up in the next week. The past few days we have been collecting magnetics data. I’ll post some information about that in a day or two. 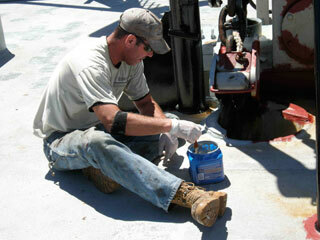 The crew work hard with no days off while at sea. Kevin's plans for his upcoming vacation do not include painting. We have weekly safety drills. 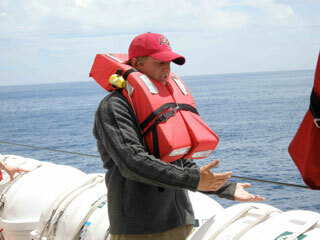 3rd mate Brennan explains the life rafts. 2nd mate Heather mans the bridge. She spotted some whales earlier today.